The ghost of a Vox Phantom? This distinctive-looking electric offers self-powered performance and play- anywhere portability. Most of all it's great fun. Fun factor. Excellent rhythm section. Body shape makes seated playing very awkward. Guitar sounds are somewhat lacking. No external PSU alternative. Most often seen on amps, the Vox logo has graced electric guitars since the late 50s. The latest line to bear this famous brand was launched in 2007 and, rather than relive the past, it adopts an all-new approach. But the recently introduced Apache II contradicts such forward thinking, at least looks-wise, as its distinctive styling is borrowed from the oddly angular Phantom, one of the company's iconic designs first seen in the 60s. Back then, it created quite an impact, and the shape still looks decidedly different today. Apart from this retro flavour, the Apache is brought bang up to date by combining two concepts. 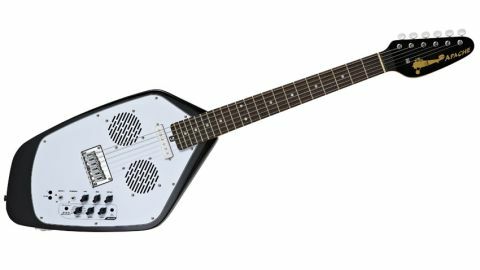 It's classed as a travel guitar, complete with an onboard amp and twin speakers, but also features a built-in drum machine. Although certainly novel nowadays, the idea of including rhythm patterns is almost as old as the 60s styling, being something of a fad during that decade courtesy of Japanese brands such as Fresher and Guyatone. "Vox obviously feels that, by incorporating an amp, speakers and drum machine into one instrument, it has created the ultimate takeaway electric"
Indeed, self-amplified electrics would also become plentiful during the 80s, but neither notion caught on. Vox obviously feels that, by incorporating both into one instrument, it has created the ultimate takeaway electric. While the rest of the company's current guitar catalogue comes from Japan, Korea and Indonesia, these are the first Chinese-made examples. Vox initially used the Apache name in the mid-60s for a strangely shaped and short-lived solid. This new versions has nothing else in common with that oldie and, instead, the headstock's biplane decal suggests an aircraft association. The company is oddly coy about broadcasting the Vox name, and just a large Apache logo partners the plane. Gold graphics contrast with the black face of the spear-shaped headstock, the latter another example of 60s Vox styling. It boasts white-buttoned, vintage Kluson-type tuners, while a large rear sticker indicates maker and model identity. The Apache II and its sister model, the Apache I, are identical. The latter being based around Vox's old tear drop Mark-shape. Vox calls it a travel guitar, but this description must refer to its all-in-one attributes, as its measurements are actually almost full-size, unlike the significantly scaled-down dimensions usually employed on most manufacturers' properly portable six-strings. The bolt-on maple neck adopts a mainstream-style C profile and is only slightly foreshortened, with the 610mm (24-inch) scale rosewood fingerboard carrying a full complement of 22 medium-gauge frets. Also, the basswood body isn't noticeably any smaller than normal, while the overall weight is an easily managed 3kg. Echoing its original inspirations, the Apache II's awkward offset angles do make it unwelcoming to play when seated. The finish is consistently high shine, with the various colour schemes contrasted by a large white scratchplate. The Apache II employs a new outline, compared to its spiritual predecessor the Vox Mark, necessary to incorporate all the onboard electrics. The onboard electrics comprise a single-coil pickup sited at the neck, plus controls topped with suitably shrunk, Vox-like pointer knobs. An internal 0.07-watt amplifier is governed by volume, tone and gain pots, while two mini-switches select overdrive and power on/off. In the latter mode, the signal from the pickup goes into the side-mounted output jack, which allows the Apache to plug into external amplification. Engaged via a touch-type button, the accompanying rhythm section features level and tempo controls, plus a rotary switch providing 10 different drum patterns and an extended song alternative. The range on offer spans various styles, including rock/metal, blues, jazz/funk, country, reggae and dance, while a second touch button supplies six variations for each of the 11 options, with choice denoted by three LEDs. The latter also serve as sharp/flat indicators when the Apache's E-string tuning function is selected by holding down the same button. A mini-jack input accepts an mp3 or CD player, while a second feeds stereo headphones, muting the instrument's twin three-inch speakers in the process. Hardware is more minimal, with a simple six-saddle bridge and through-body stringing. A sizeable rear compartment accommodates the six AA batteries that give 26 hours' playing time. No provision is provided for an external power supply, although this would be a useful alternative when portability isn't required. Powered up, the Apache's onboard amp initially proves somewhat polite. Even with volume, tone and gain full on, the output isn't enough to really offend anyone. At these settings, delivery is a bit fuzzy around the edges, tonality is on the boxy side and the speakers add flatulence when pushed. "Engaging the overdrive cures any low-level complaints, courtesy of a sizeable, pre-set dollop of trashy distortion"
Engaging the overdrive cures any low-level complaints, courtesy of a sizeable, pre-set dollop of trashy distortion. This significantly increases volume and sparks up performance, while the amount of extra gain now on tap easily provokes internal feedback. Far from being a problem, this introduces a random hooligan element that adds to the fun factor. However, switching on the rhythm section shows the latter can go louder still, drowning out the guitar - just like a live drummer! The selections and patterns available should offer enough variety to please most players, while the results pack plenty of punch. Unlike the six-string side, they come through loud and clear on the internal speakers, ensuring a fairly realistic and dynamic delivery. With the Apache plugged into an amp, the solitary single coil is supplied at full volume, sounding clear-toned and meaty. Engaging the onboard electronics immediately reduces output, even with the relevant controls at maximum, but the overdrive facility again rectifies the situation in its own dirt-laden way. The Apache's build quality is up to par for the price, likewise playability. In terms of performance, however, it's more of a mixed bag. Apart from the flat-out or distortion settings, the onboard sounds are disappointing. External amplification improves things, but, of course, this then defeats the instrument's self-powered, play-anywhere purpose. The rhythm section is useful in terms of variety, volume and tonality; it's simple to use, so is an ideal play-along tool. Cutting the gimmick factor back, you could, for example, buy a Squier Strat and a Line 6 Pocket POD for a similar outlay, but you'd be confined to headphones. Meantime, the Apaches do their intended job, offering something different and a whole lot of fun to boot. Serious, professional guitars these are not - it's all about the fun factor.